This is J Dogg Phair’s original, traditional BBQ sauce (compared to the eclectic bacon, port wine, chipotle symphony of Thought Yo Knew!) with a lot of positives for me: great packaging, bottle, cooked flavor, and high quality ingredients. The aroma and taste of the sauce were tangy tomato (like Stubbs or even Open Pit) – strong on vinegar, garlic, molasses, and onion. Uncooked I found the sauce a little strong on chicken which limits it’s applicability to some forms of usage – it’s not the kind of sauce I’d pool up on the side of the plate for chicken but would probably work really well for red meats. The consistency is on the thin side, but is loaded with specks of flavor from real chunks of onion, pepper, and sesame seeds. Cooked, I found it to be a nice flavorful sauce with a lot of complexity from ingredients like beer, garlic, brown sugar, cider vinegar, molasses, mirin, (a rice wine like Sake), soy sauce, sesame oil, black pepper, green onion, Chile Pequin, Worcestershire. 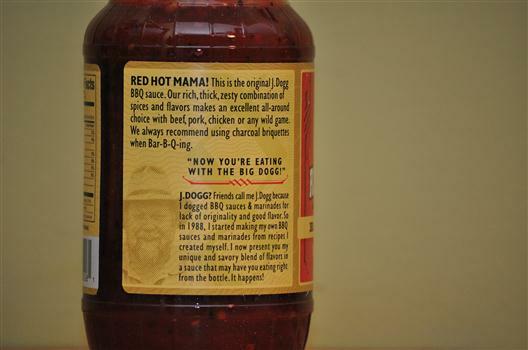 It has a fair amount of heat – a 2 out of 5 on the heat scale for me – enough to warm up the mouth while not burning it. 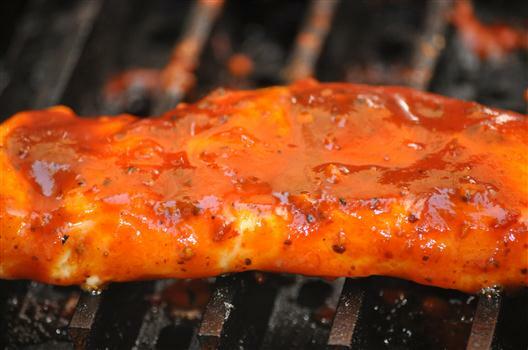 All in all, this is a good grilling sauce with some complex and fun flavors – with a kick! 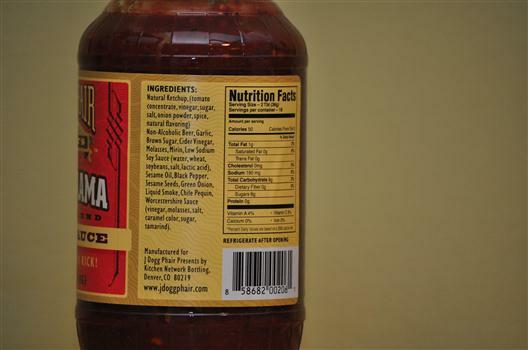 When I created this sauce I had in mind something that would deliver a kick to a mouth watering brisket or beef ribs or (short ribs). I do think it’s a little much for chicken. The reason for the thinness is for mopping it on a brisket over a good long smoking. I just thought I’d let you know also that if you mix a couple of tablespoons in a Meatloaf mixture and then put a slim coating on the top with a couple strips of bacon and then throw it in the smoker or in the oven it’s incredible. Ingrediant list looks excellent! Love to try it.